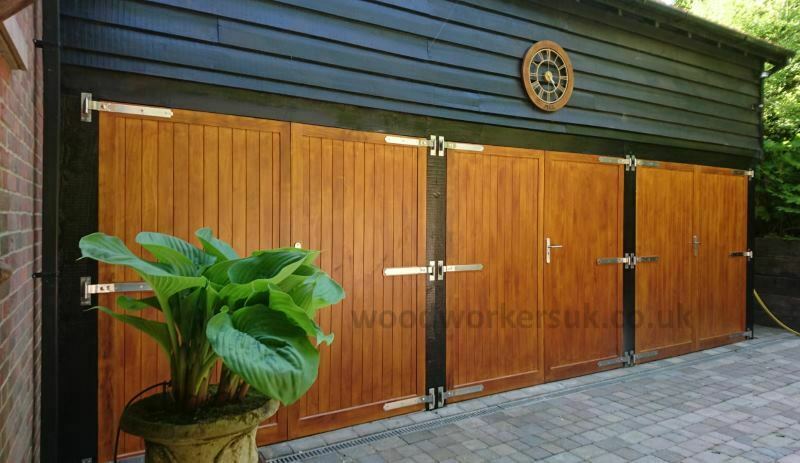 Are you looking for gates or garage doors that are made from the most durable timber available? Are you also looking for gates or garage doors that are made from the most sustainable timber available? Well, in that case, look no further than Accoya gates or Accoya garage doors. 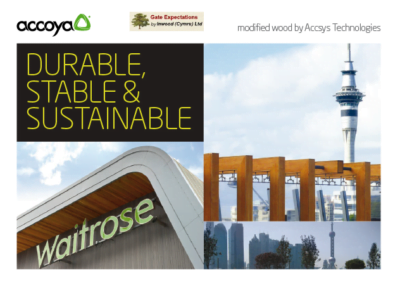 Accoya® is a modified softwood that is more durable than the best hardwoods around. Accoya is actually a timber called Radiata Pine which is grown in New Zealand and shipped to Holland, where it undergoes a process called ‘acetylation’ which gives the timber its excellent durability. 3 Pairs of our Alyn framed ledged and braced garage doors in A1 Accoya finished in Sikkens Light Oak. Unlike tanalised softwood, where the treatment usually only penetrates a couple of millimetres into the timber, with Accoya, the treatment goes right the way through to the core of the timber. As a result of the acetylation process, the Accoya is warrantied for fifty years when used and installed in a position not in contact with the ground. If the Accoya product is in contact with the ground when installed, then the warranty is twenty-five years. 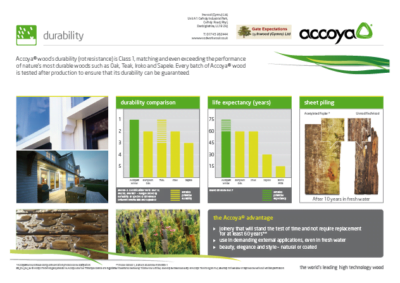 Accoya is a timber of the future, and best of all it grows on trees! Basically, in plain speak, the timber is treated with Acetic acid; this causes the chemical structure of the timber to change in such a way that the timber cannot absorb any moisture, therefore meaning the timber cannot rot. As well as increasing the timber’s durability, the fact that the Accoya cannot absorb moisture also makes the timber a lot more dimensionally stable too! 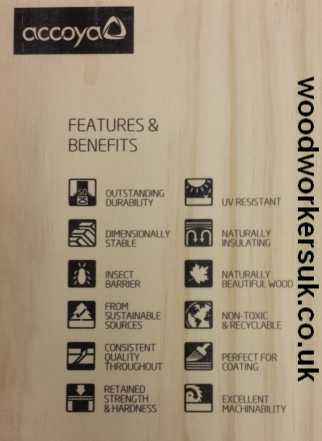 The acetylation process also increases the hardness of the timber and also increases the timber’s resistance to UV damage, and before you ask, the treatment is totally non toxic – it really is a wonder timber! All of our gates are available manufactured in Accoya. 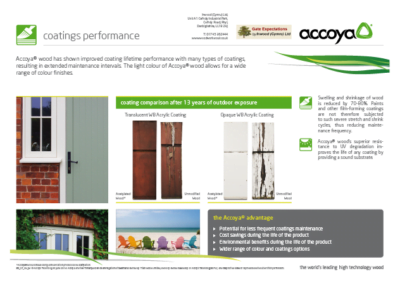 The benefits of Accoya modified softwood! The maintenance cycle is increased! Hate spending ages painting or staining your woodwork? Then Accoya is also good news for you! Due to the timber’s outstanding dimensional stability and resistance to the effects of UV, the coating system you choose for your gates or garage doors will have a longer lifespan, meaning more time between re-coating, giving you more time to spend doing what you like doing! Looking for long lasting Accoya garage doors? Please click here to see our full range of made to measure garage doors. We sort of went back to school in December 2012, as we had an instructor from Accsys Technologies (the people behind Accoya) come into our workshops; we spent a day learning more about Accoya, its properties, the processes, best practices and general dos and don’ts with this wonder timber. As a result, we’re now Accoya approved joinery manufacturers and have a certificate to prove it! Accoya wood sounds too good to be true? 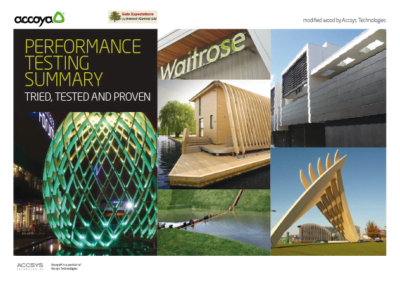 If you’re reading this and thinking our claims of the wonders of Accoya are over-inflated, or you would like even more information on Accoya, the very clever people at Accsys Technologies have put together several informative PDF’s (links below) that explain everything about Accoya in greater detail! The one drawback, if I can call it that, is with either Accoya gates or Accoya garage doors then it is recommended you use stainless steel ironmongery rather than galvanised or black ironmongery. As with Oak gates and garage doors, the acids present in Accoya will corrode both the black and galv. ironmongery – this will then stain your gates or doors. For best results, use A2 or A4 grade stainless steel hardware/ironmongery and fixings. Naval brass can also be used but avoid Galv., black or zinc plated ironmongery/hardware and fixings. Accoya can be either painted or stained like normal timber, drying times for your chosen finish can be longer than for other timber. If staining the timber then we need to know at the point of order as Accoya can suffer from some black staining (a side effect of the acetylation process but no detriment other than visual) which can show the stains (but not paint!). If staining our Accoya gates they then generally finish at 65mm thick (rather than our usual 70mm) so we can remove all the black, for garage doors we usually have to use the next thickness of timber up (58mm thick) to get a stain free 45mm finish. If you’ve an Accoya related query not covered in any of the above PDF’s then please do get in touch.